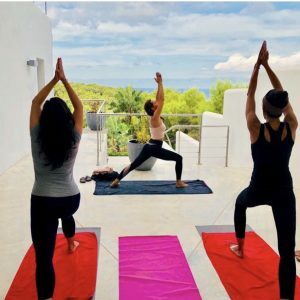 5 reasons to relax to the max a yoga retreat at Ibiza! When you are at Ibiza, you notice quit a lot about yoga. Also when you look at the internet, you will find a lot of information about yoga retreats at Ibiza. The word yoga comes from the Sanskrit word Yuj which means “uniting”. It’s about uniting body and soul. It’s associated with exercise that will recover the human system. It’s also a lifestyle about bringing more balance in all layers of our existence that seem to be opposite, like body and soul, inside and outside, excitement and relaxing etc. Anyone can do it, age doesn’t matter, it’s for people with or without considerations of health. I thought it’s an interesting subject. Driving around in our rental car at Ibiza I suddenly felt the joy to practice yoga. I don’t practice yoga at home, not because I don’t like it, because it’s healthy, you do exercise and it will bring relaxation. But I just didn’t see myself in lotus position somewhere at a gym. 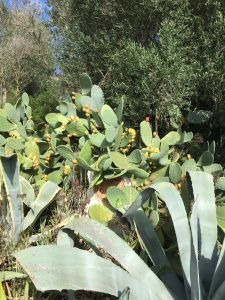 But while driving or walking around Ibiza, enjoying so much beautiful nature and views, and with the beautiful beaches, all of a sudden yoga practicing will get a total different dimension. At least for me. You are already in a “zen” state of mind, because that’s what holiday does with you. And I just could imagine myself practicing yoga, at a lovely beach with a perfect sea view right in front of me. How relaxing can it be? It just completes the whole picture. So i decided to take a yoga class and i enjoyed it! That’s why I will give anyone who loves Ibiza 5 reasons to practice yoga as well, to relax and forget the busy lifestyle from the live we life at home. Ibiza is such a beautiful island! It’s green, and with lot’s of color. ( just think about the beautiful bougainville that’s everywhere at the island ) Then think about all the beautiful beaches that the island has to offer, with the lovely turquoise color of the sea. Don’t forget it’s beautiful sunsets as well. 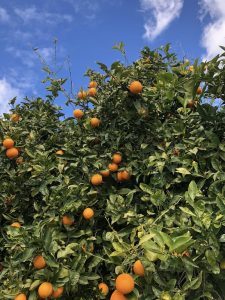 Or the fields with almond trees or all different fruit trees. All these ingredients will give your yoga lesson something extra to enjoy and relax while practicing. After practicing you want to keep that relaxing flow of course. So what about a healthy breakfast with sea view and just enjoying the relaxing moment you created for yourself for a bit longer? Don’t forget, yoga can be quite intense as well, so after the hard work you deserve a spoiling moment for yourself. There are different places where you can join yoga classes right at the beach, and after they serve a healthy breakfast including sea view. 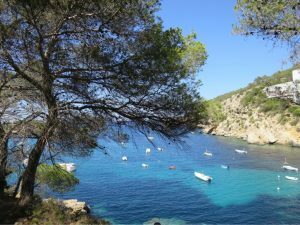 You can go to Amante at Cala Llonga, Aiyanna at Cala Nova or Beachhouse at Playa den Bossa. These are Beachclub’s who offer separate yoga classes and breakfast. A good way to start your day. At Amante they give classes from monday till friday starting from the 6th of may. Check in 8.45, the class start at 9.00 till 10.15. Price € 30. incl. breakfast. The classes are in English and Spanish. Make your booking in advance. At Aiyanna they give classes at monday, wednesday and friday from the 13th of may. Check in 8.45, the class start at 9.00 till 10.15. Price € 30 incl. breakfast. The classes are in English and Spanish. Make your booking in advance. At Beachhouse they give classes from monday till friday at 9.30. There are no costs. You can make a small charitable donation if you wish. All proceeds will go to local charities which help to keep the beach and sea clean. In general the weather is good at Ibiza. The sun shines a lot and even in winter it can be 18 or 20 degrees at daytime. When the summer months are coming up you will have a nice sea breeze which makes the temperature very nice as well. This makes it great to practice yoga outside. When you spend your holiday at Ibiza you can take yoga lessons at different Beachclub’s. But you can book a yoga retreat as well. Which means a complete holiday most of the times staying at a nice villa where you are able to practice yoga including healthy meals during the day. A week for your self having “me time” or together with your friends, where everything is focused to charge your battery again in a relaxed way, and of course with enough time to explore the island as well. These retreats are available as well at the villa which is on this website. When you book it with friends for example, we can make sure there will be offered different yoga classes during your stay, and after you can book professional massages for example or a combination with detoxing. Make it a wellness week. All with professional support of course.